Described as “one of the most agile and original jugglers of improv and adventurous composition to have appeared in the UK in recent times”, multi-award winning saxophonist, composer and bandleader Trish Clowes talks to Laura G Thorne about her February performance at the 606 Club as well as her upcoming release on Basho Records. LondonJazz News: You are playing at the 606 Club Chelsea on Wednesday 13 February with drummer Winston Clifford, pianist Jim Watson and bassist Joe Lee. How did this gig come about and what led you to these players? 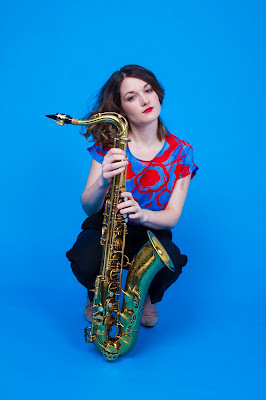 Trish Clowes: Over the years Steve Rubie has asked me to do a few gigs that have got me playing with people with whom I don’t usually work – I have very fond memories of playing in a line-up with alto hero Pete King in 2017. In the current climate (certainly for my generation), these are cherished moments because so often as a bandleader, you really have to focus on just one or two main projects. For this gig, he suggested I hand pick a band that could feature someone I’d always wanted to work with, and I immediately thought of Winston Clifford – a legend of our scene here – and he was free! Jim Watson is someone I’ve also wanted to play with for a while (and I’d actually heard him and Winston in a rhythm section together last year). We’d already spoken about doing something, and then this opportunity presented itself. Like Winston, he’s one of those people who, when you hear him play, you want to get involved and be part of the conversation. Joe Lee is a great young bass player who’s just finishing up his studies – he was one of the first students I worked with at Guildhall and so it’s a real pleasure for me to invite him to the stage. LJN: Is there a particular theme or concept that is driving the choice of repertoire for this 606 performance? What is the thought process that goes into deciding what material to play? TC: When I know what my “cast of characters” is going to be for a gig, I start thinking about all the tunes I think would be a good fit, and anything I might have been checking out recently. I also ask the players if there’s anything in particular they’d like to play. There’s going to be a bit of everything this time I think… Joe Henderson, bit of Wayne Shorter… Coltrane… ooh, I see a theme – tenor greats! But also, Toots Thielemans, a couple of mine… the set list is still evolving. LJN: You are known for your considerable skills as a composer, winning a BASCA award for your first BBC commission The Fox the Parakeet & the Chestnut in 2015 (as well as many other accolades). What inspires you to write? TC: Oh, anything can inspire me. I think it’s a bit like learning a language… the more deeply you know the language the more you think in it. I’ve had ideas for tunes whilst washing up or in the middle of the night… in response to poetry, a book, a film, a political issue… or just a totally abstract musical concept. Most of all it’s people who inspire me. I’ve written loads of tunes that are essentially about celebrating a certain aspect of someone’s playing, as in, creating a springboard for them to improvise from… something I know they will enjoy re-inventing. LJN: Compared to playing an instrument, does composing and arranging music exercise another part of your creative musculature? Do you have a preference? TC: There’s no separation for me. Performing, improvising, writing – they are all extensions of each other. Obviously, performing/improvising in the moment is highly reactive… composition is more reflective – it encompasses improvisation, but you can take longer to make decisions, and so you can debate with yourself on how to develop ideas. But I couldn’t be without any aspect of all the above. LJN: Is there a secret to being an exceptional musician, and if so, will you tell us what it is? LJN: Your band My Iris (which we hear is releasing a new album soon) has been described by one writer as “the jazz of the future”. There’s a lot of talk these days about the resurgence of jazz music – do you agree with that assessment and where do you see yourself within that landscape? TC: I have to admit I’m pretty excited to be releasing this new album – it’s coming out at the end of April on Basho Records. It’s a great honour for me when it seems like my music is connecting with people – going out to play and leaving it all on the stage, that’s how I like it! Of course, this connection starts with having great people on the stage (both live and when I’m imagining what to write for them next… ‘them’ in this case being Chris Montague, Ross Stanley and James Maddren).